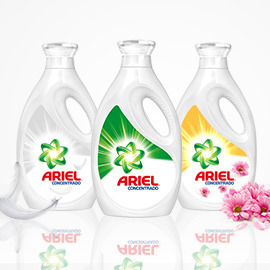 Ariel is THE premium detergent brand that provides a superior cleaning. All over the world, women and men who do laundry trust it as the most efficient brand to remove stains and make clothes perfectly clean. Ariel knows and understands consumers, and they recently created two new products (or “variants”) that truly answer people’s needs: Ariel & Freshness and Ariel Sensitive Skin. These two new products are part of the Ariel Family.